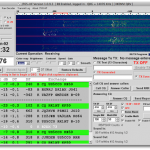 Disponibile nell’area Download JT65-HF per Mac OSX. L’applicazione contiene tutto il necessario per un corretto funzionamento e supporta schede audio con una risoluzione testata fino a 24bit 96kHz. Se avete qualche problema segnalatemelo pure nei commenti. L’applicazione richiede OSX 10.6.8 (Snow Leopard) o 10.7.4 (Lion). Per informazioni più dettagliate su questo interessante modo e le istruzioni, potete fare riferimento al sito principale. Su psk reporter trovate una comoda mappa per tutti i modi principali, JT65-HF compreso! Un ringraziamento particolare a Geoffrey AB3UM, TJ W0EA che si sono prestati per i test, ed a Joe W6CQZ a cui va tutto il merito del programma! Come riportato da José VA3PCJ, che ringrazio per essersi prestato ad alcune prove, sembrano esserci alcuni problemi con OSX 10.10. Quasi tutti i problemi si risolvono installando la versione più recente di XQuartz. Questo articolo è stato pubblicato in Hamradio, JT65-HF OSX, Mac OSX e ha le etichette Hamradio, JT65-HF, Mac. Aggiungi ai preferiti: link permanente. Scrivi un commento o lascia un trackback: Trackback URL. I have been waiting to see a port of wsjt to the Mac for a very long time – grazie tantissimi. I am active on d-star – would love to have a chat with you sometime. can decode the signal. But, I could not set the COM port number. I am using the USB-Seril converter (driver: /dev/cu.PL2303-000012FD and tty.PL2303-000012FD). How can I set com port? Please let me know the method to set the Com port number on the software. It works fine. I was able to QSO with VK4BL. OSX10,7 + Digital VOX Sound Card Interface ( KH6TY) . FT-857 3W 15m 1/4 vertical. Thanks for the report! 🙂 I hope to see you on air! Have fun! Thank you for making the effort to port JT65-HF to the OS X. Your version is the best, most stable of all the others. I run the software on a Macbook Air, running OS X 10.8.2. The rig is a Elecraft KX3. Thanks for the report! I was just a bit busy 😉 Have fun! 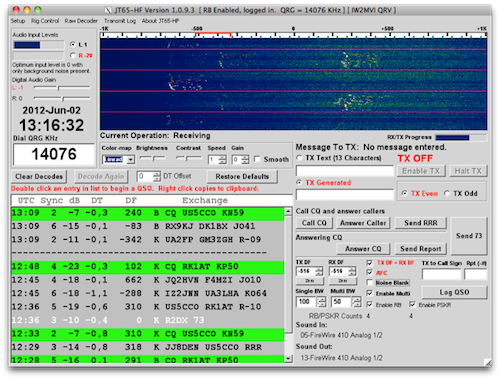 I’ve been using JT65-HF OSX with a MacBook Retina running OSX Yosemite 10.10.2. It works very nicely and I have several QSOs to proove it. However, I have found two glitches: a) the only way to quit the program is to opt for a “force quit” (which does not save its configuration), and b) I am unable to find in OSX the file with the saved logs (the program indicates a Windows-like subdirectory tree with subdirectories that do not exist in OSX (not even as hidden ones!). Would there be an easy way to export the log files into a subdirectory readily accessible in OSX? Much appreciated, and again thank you for making this software available. Hi, I’m really happy your are enjoying it. For the first problem I’ll check ASAP and I’ll place an update on the download area. The App will close correctly of you press the red button on top left? The setting isn’t also saved if you press “Save Setting and close Window” under setup? For the log, in the same window you have a small icon on the right, click it, go down and choose “My Documents”, this is your “Documents” folder on OSX, choose the place you like. Let’s me know if work, Have fun! Hi Francesco, I greatly appreciate your prompt response. There is no red button on the top either in the Apple menu or the top of the program frame. In the menu at the top of the Mac screen (JT65-HF OSX/ Edit/Window/Help) I can choose “JT65-HF OSX” and in the drop menu with three choices: Eject Disk/Forceful Quit/…/Quit. The only one that exits the program is the “Forceful Quit”. For the location of the RX/TX history file (JT65-log-csv) the program offers a location that cannot be changed: “C:\users\myname\Local Settings\Application Data\JT65-HF\”. This path idoes not seem to exist in the tree of the OSX. Also clicking on the folder icon to the right of the path brings the windows-like tree but highlighting “My Documents” in the tree freezes the program. Editing the path causes a message of “Invalid file name” and upon exit using “Forceful Quit” the new path is not saved. Very sorry about the wrong name above… sincere apologies! I found how to change the directory for the “jt65hf_log.adi” file in the Mac: highlight the new subdirectory in the tree and click “OK”… and I can now easily access the ADIF log file in the Mac. Only glitch is that since exit is only possible using “Forceful Quit” the new path is not saved for future sessions, but that is only a small inconvenience compared to the ability of running JT65 in the Mac. Best regards, and thank you again.